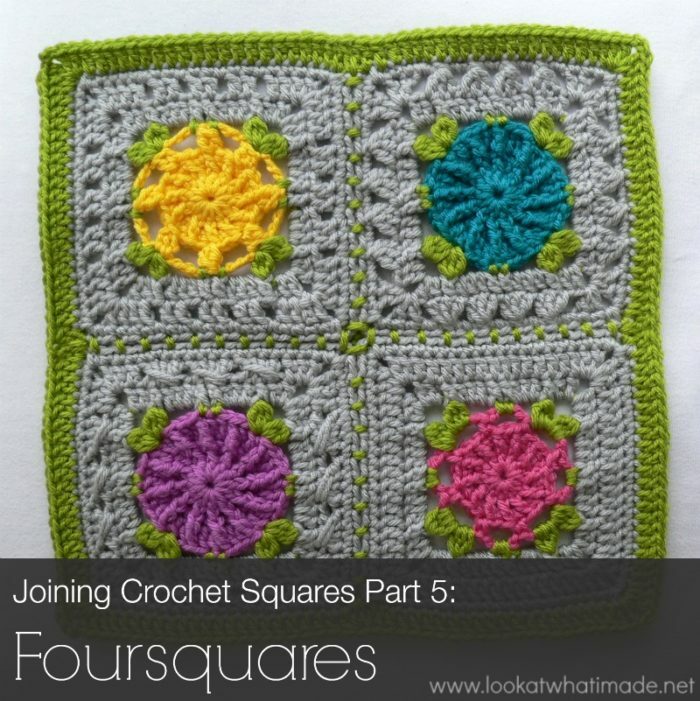 I don’t think “Foursquares” is an existing technical term, but it is what I ended up calling my CAL squares after joining them to each other in fours. You can read more about that HERE. You can also see all the completed Foursquares HERE. 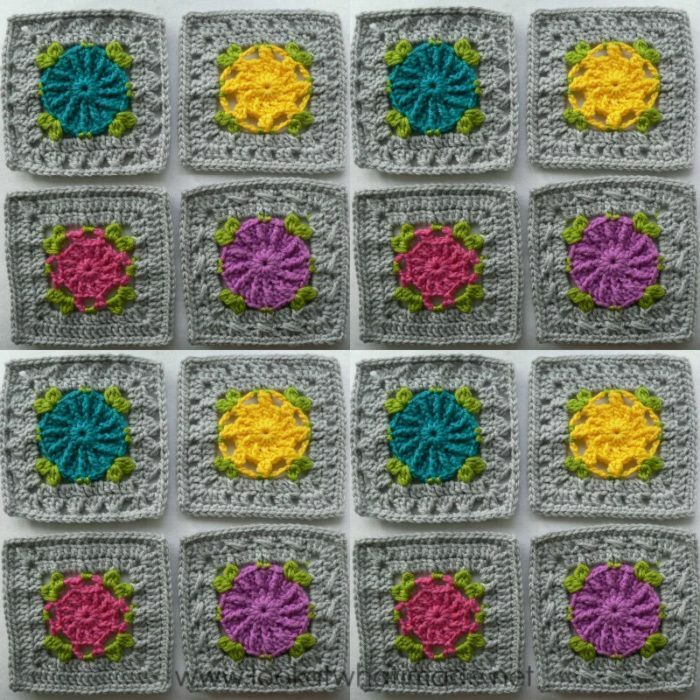 In Part 1 (Preparing to Join Your Squares), I mentioned that you should think outside the box when attaching your squares. Although the traditional grid configuration is brilliant…. …there are times when you might feel like doing something else. 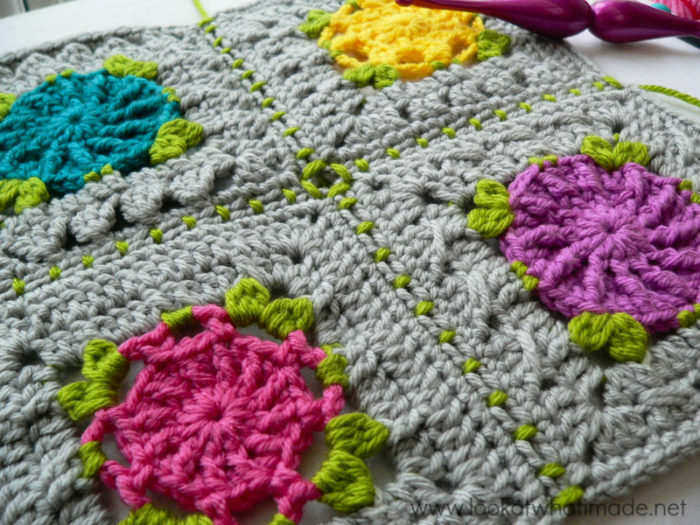 By crocheting 4 squares together, and then adding a border, you can create a completely different feel. 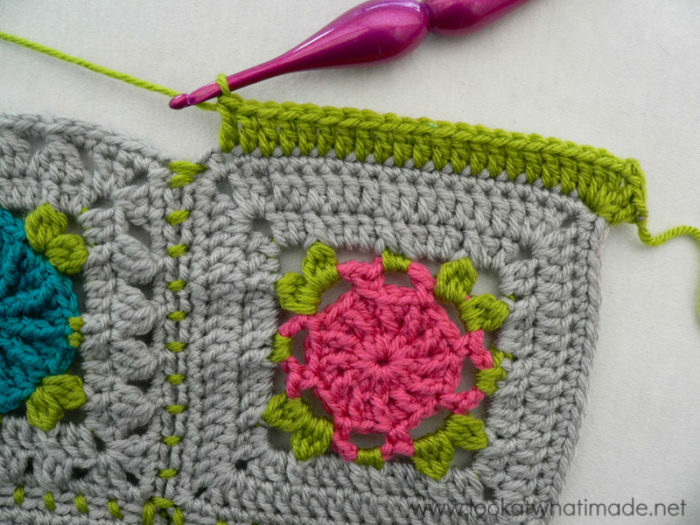 In this tutorial I will show you how to turn 4 afghan squares into a Foursquare by joining them and adding a simple border. 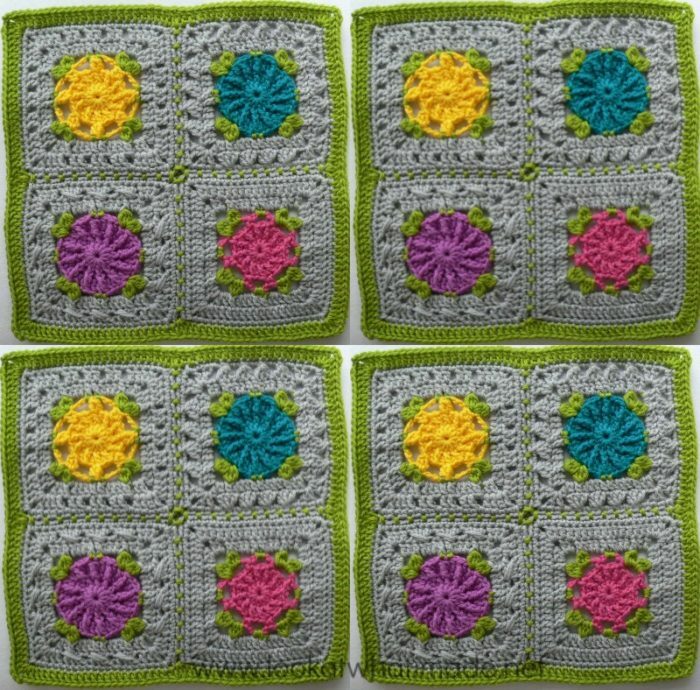 You can then join these Foursquares to each other to create your afghan. 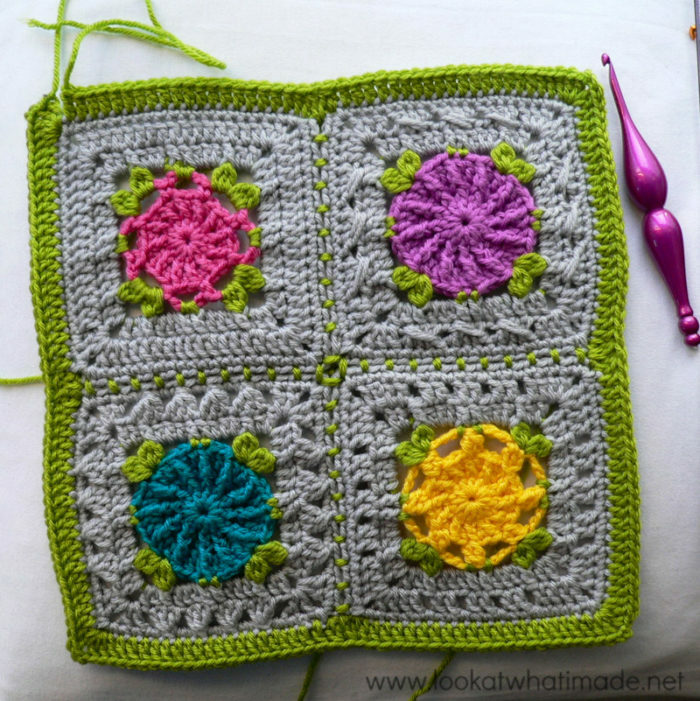 Once you have joined your squares you will need to add a border to frame the Foursquare, otherwise it will not be distinguishable between all the other squares in your blanket. 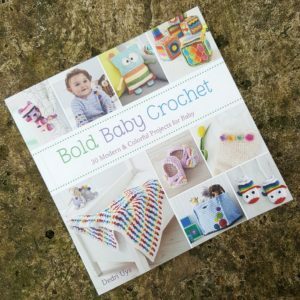 I am using a simple round of double crochet, but again, you can use anything your heart desires! 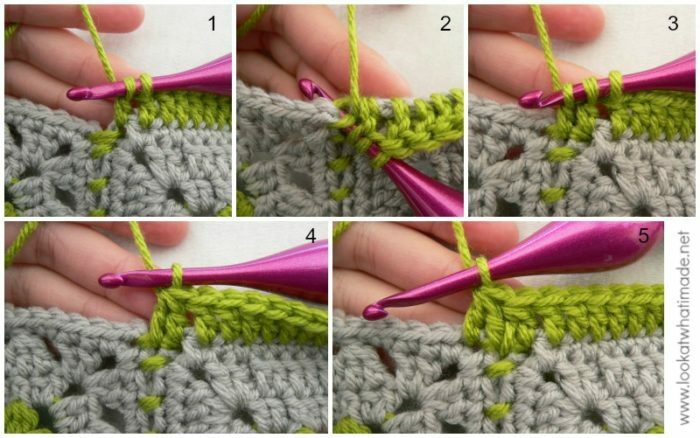 To add a double crochet border, start with (2 dc, ch 2, 2 dc) in any corner around. Please note that this is now considered a single square. When referring to corners I am only referring to the 4 outside corners, not the inside corners that have been joined to each other. 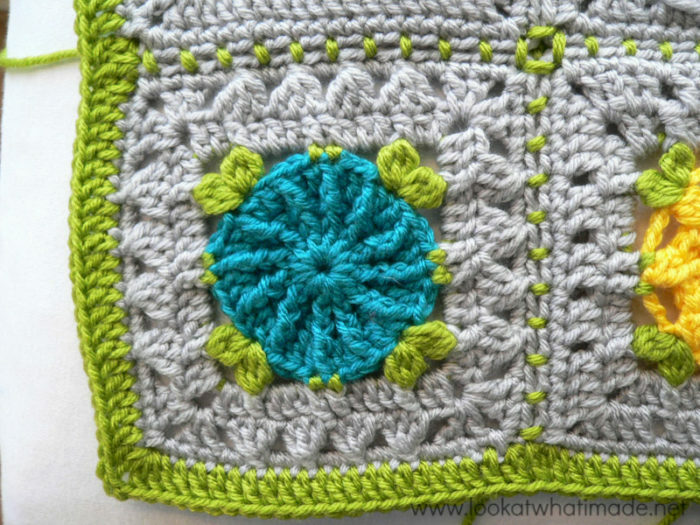 Once you have made your corner, dc in each stitch across until you get the the “inside” corner space of your first square. 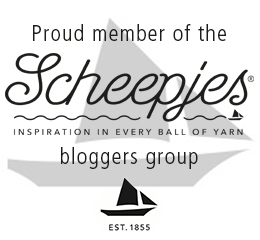 Because I have a tight join I am not going to make a separate stitch into the join. What I AM going to do, to avoid a slight gap, is make 2 dc2tog’s over the join so that my border looks fuller in that spot without adding any stitches. So starting in the “inside” corner space of the first square: yarn over, insert your hook into the corner space and pull up a loop. 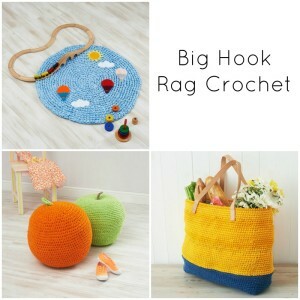 Yarn over and pull through 2 loops on your hook (2 loops remaining on hook) – see Photo 1. Yarn over and insert your hook into the stitches of the join (Photo 2). Yarn over and pull up a loop. 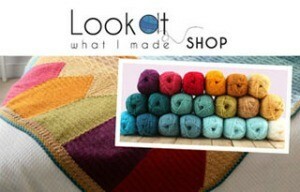 Yarn over and pull through 2 loops on your hook (3 loops remaining on hook) – see Photo 3. Yarn over and pull through all 3 loops (Photo 4). You have now successfully completed one dc2tog over the “inside” corner space and the join. Repeat the process again, this time making the first leg of the dc2tog into the join (that already contains the last leg of the first dc) and the second leg into the “inside” corner of the second square (Photo 5). Dc in each of the stitches across the second square. When you get to the corner, make (2 dc, ch 2, 2 dc) into the corner space (as before) and continue around. When you have bordered your entire square, fasten off and work away your tails of yarn. I like to use the Invisible Join method when finishing off a square as it yields a very neat (non-bumpy) finish. Notice how the squares “dip” slightly at each of the 4 join points? This is easily remedied by blocking your Foursquares once they are complete, although this is not strictly necessary. 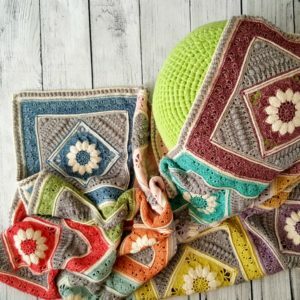 When you join the Foursquares to each other to create your blanket these “dips” will be pulled up to the height of the rest of the stitches. 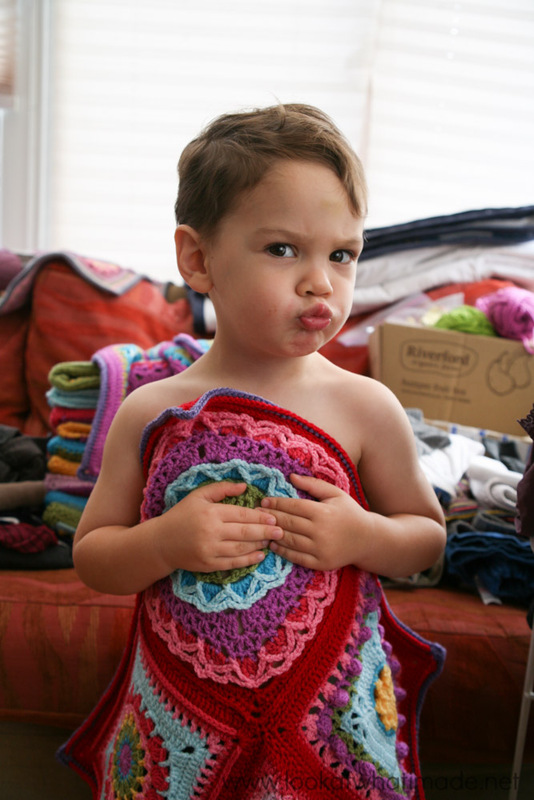 To end off with I will leave you with a photo of my youngest “modelling” one of my Foursquares. He insisted on “wearing” my “yarn”. I didn’t even realize that he’d pulled this “blue steel” face until I looked at the photos later on. 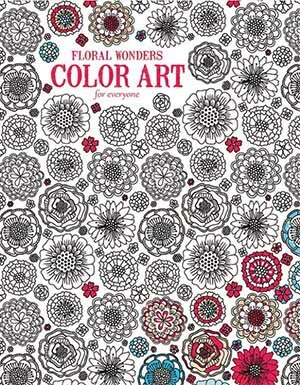 When I saw this CAL I fell in love with it and am now making it as a surprise gift for my sister. 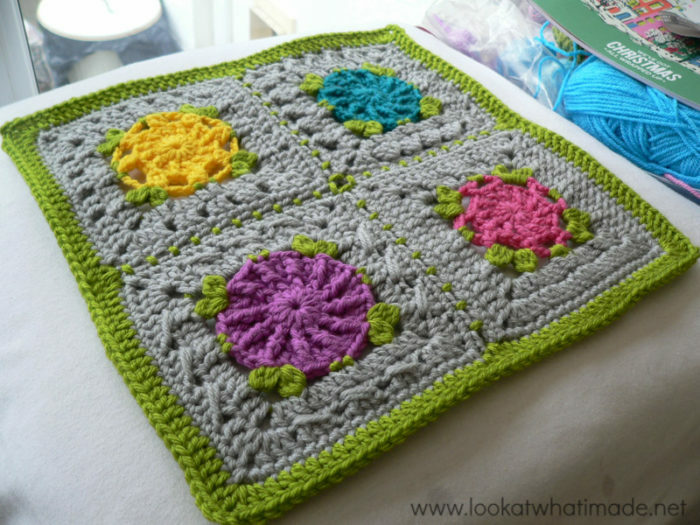 I have opted in using Sophie’s Garden as centerpiece and am joining my squares with your foursquare method. 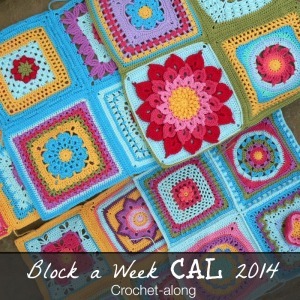 I noticed that you made a row of double crochet around the completed foursquare block. 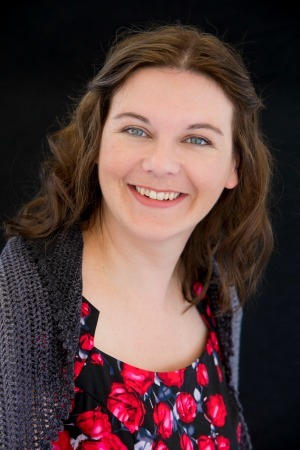 When I join Sophie to the rest of the foursquare do I also do it with the sc, ch1 method. Do I have to make a row of dc’s around Sophie before joining it to to foursquare? Thank you so much for your lovely tutorials that is helping newbies like me tremendously! Hi Marina. Thank you for commenting. 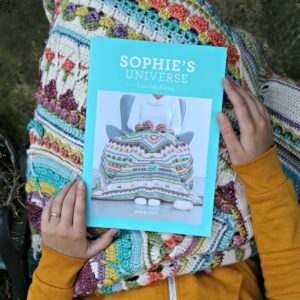 I don’t think anyone has joined Sophie to the Foursquares yet, but yes, if you want to, you will need to add a dc round around Sophie as well. 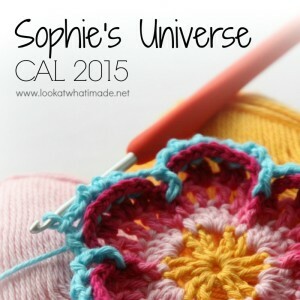 You want to end up with the same number of stitches around Sophie as you do around each Foursquare. 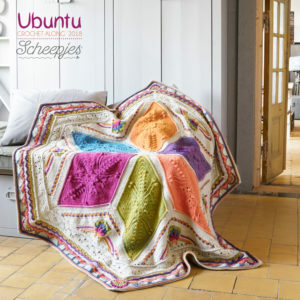 You would also use the same joining method for the whole blanket. Hi Diane. 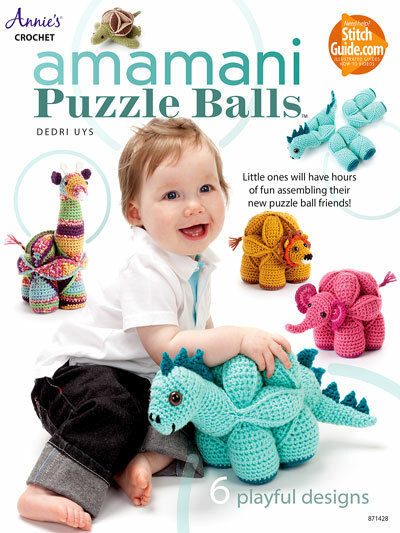 The pattern for the squares isn’t available yet, but it will be very soon. I am very glad you like them. Diane, I can’t say when, but soon. I just have to get ahead with the CAL tuts. Really pleased you like them that much!